Emma Watson’s first post-Potter role is already receiving praise. “Perks of Being a Wallflower,” based on the critically acclaimed novel of the same title, features Watson in a cast of young up and comers. Also, her character is American in the film. Watch as MTV’s Josh Horwitz challenges her fellow cast mates to try her accent on for size. Joaquin Phoenix is making a comeback in a very tiny, huge way. “The Master” which only played in five theaters in New York and L.A. broke the per screen earning record. The film raked in $145,949 per screen which beat out Wes Anderson’s”Moonrise Kingdom” for the title. “The Master” is already earning some serious Oscar buzz. Former Talking Head David Byrne and indie guitarist St. Vincent released a collaborative album now available on iTunes or streaming on Spotify. The Royal family is fighting the paparazzi back. After photos of Duchess Kate Middleton were printed on the cover of several magazines, she decided to take legal action against French magazine ‘Closer.’ Meanwhile, the internet was loving poking some fun at the frenzy. Enjoy this hilariously awkward video by Lena Dunham to introduce “The New Yorker” app. It’s pumpkin season! Here are some delicious ways to get your fix. Bored? Here’s some free stuff to do! 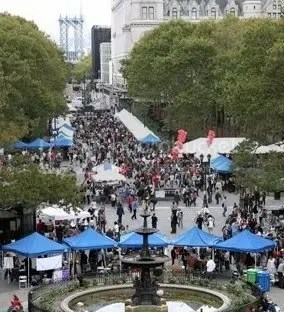 Smithsonian Magazine’s Free Museum Day Live! It’s that time of year when everyone and your mom Facebook posts, tweets, and blogs about what they are thankful for. They will all be very similar. It is true that I am extremely thankful for my amazing family and friends, my education and my jobs. However, we’ve all heard that before. So my ‘giving thanks’ post is going to be a tad different. I believe we should be just as thankful for the very little things in life that pick us up as the big things. Here it is: my “I’m grateful for silly things” list. 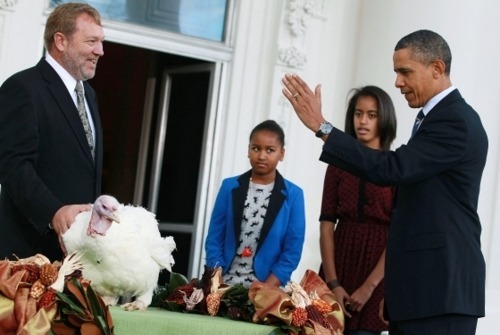 The President pardoned two turkeys this morning, but the real winner was Sasha Obama. Not only is her blazer fun and bold for fall, but that side-eye she’s shooting her father is downright epic. She knows, as do I, that this whole turkey-pardoning bit is stale, and also that, President or not, her dad is embarrassing. Join the club, Sasha. Join the club. 2. 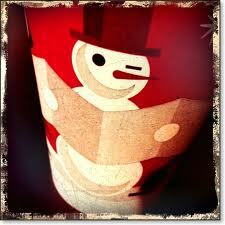 I’m grateful for Christmas cups. You understand. 4. I’m grateful for Target-crazy-black-Friday-lady-commercials. Never not funny. And finally: 5. I’m grateful for ‘The Hunger Games’ trailer. I’ve watched it approximately 200 times. So excited for these movies. Okay, so I have a new website obsession. HelloGiggles is a website started by three creative, professional women for women. That’s right, a fun aggregate site just for us girls! I first started following HelloGiggle’s tumblr site because I’m a big Zooey Deschanel fan and she’s one of the founders. 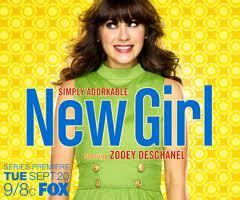 Side note: you should check out “The New Girl” if you haven’t already. Hilarious show. Then I got hooked on the site. Not only does the interesting design keep you looking, but this site has everything you could want. Recipes, funny videos, entertainment reviews, blogs from all over the world all in one place. The site also let you contribute your own content! Girls aren’t the only contributors either. While the main focus of the site is web content for women, men often contribute blogs about everything from raising their daughters to bullying. I could spend days raving about the unique content on HelloGiggles. It’s about time for a site to spring up for smart women by smart women from around the world. Love this site.